This page serves to explain how the British government approaches UK visa administration and who you need to deal with to get your UK visa. South Africans can either make use of agency assistance or they can apply directly with the UKVI. Move Up offers expert agency assistance for those who are finding this information helpful. Alternatively, South Africans not looking for agency assistance need to apply online first. If only the process was this easy? The reality though is that this process is more complex than many like to admit. Administratively challenging to say the least. The British government and its department of UK Visas and Immigration are trying to run a legally secure control of their border. They are faced with making thousands of decisions a day and are given the responsibility to keep their country safe and secure. Hopefully by now, you have found this website useful. Especially in terms of breaking down the complex nature of the administration expectations and addressing the frequent 12 stages of questions that we (Move Up) face when dealing with applicants. 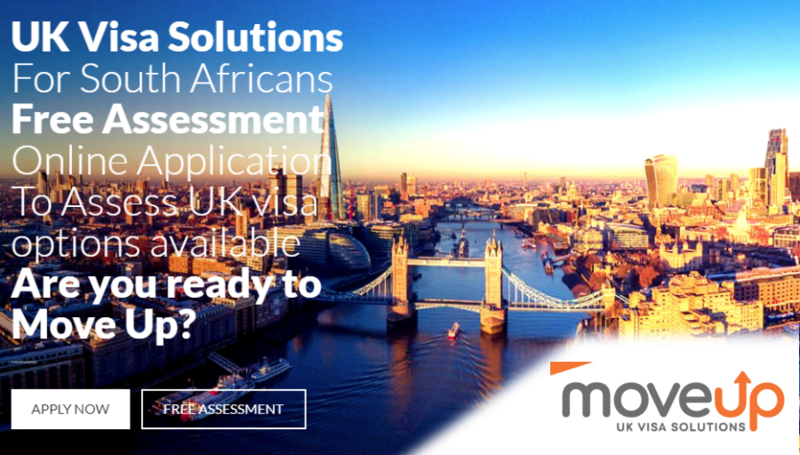 It doesn’t (and can’t) answer the question: “how does a South African apply for a specific UK visa?” because of the varying requirements for each visa. So many different types of UK visas, each with different expectations. Therefore, this page serves merely as a generalized summary of the whole process (as opposed to a detailed and specific solution – which Move Up’s consultants offer). To recap, by now you have identified a UK visa you would like to qualify for (step 1). You have also confirmed your travel documents are in order (valid passport etc – step 2). Then you acknowledge the processing times and that your travel dates are feasible (step 3). From there, you acknowledge the initial visa cost (step 4) and confirmed that you do indeed qualify for the identified visa (step 5). You are aware where you need to apply (step 6) and now we need to know “how to apply?”. 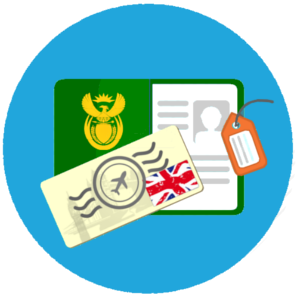 There are over 30 unique types of UK visas which South Africans can apply for. To determine which visa meets your intent, it is in your best interest that you first contact Move Up to begin getting your UK visa needs solved. Move Up ( www.moveup.co.za ) operate under a standard full case fee refund guarantee, that in the unlikely event of not being awarded your visa first time round, their case fee will be refunded in full. No hidden administration costs for offering solutions that don’t work. Call 021 761 4608 to discuss your visa options. Alternatively for more information, you can email info@moveup.co.za. For technical visa queries, you can email guru@moveup.co.za. Included in Move Up‘s visa representation is internet based applications which are done on your behalf. Making the travel experience that much easier. It is compulsory for all applications lodged in South Africa to complete this online application form (paper based applications are no longer accepted). Once the online application is submitted you can secure a visa appointment. Click here to start your online application now. This applies to independent submissions (independent of Move Up’s help). Please also note: Payment for the UK visa is only done on the visa4uk.fco.gov website. No other form of visa payment is accepted in South Africa. If you have been told to make payment through MoneyGram you are most likely being scammed. “Who is Teleperformance?” you might ask. Teleperformance have been appointed to handle the front of house for the British High Commission in Pretoria, formally known as “commercial agency” who handle the UK’s Visa Application Centres. They are a glorified courier service that receive passports and visa applications on the British High Commission’s behalf. It is important for South Africans to realise that they have no bearing on the final outcome of the visas approval. Teleperformance are only responsible for sending the application to Pretoria. They do have the tendency to make applicants second guess their application and should not be taken seriously. More details regarding Teleperformance can be found on our Visa Application Centres page. How can I call Teleperformance? Folks, we get this question daily. It is natural to want to talk to the UK government about your visa requirements. Locally though, Teleperformance does not facilitate call in queries. The next step (Step 8 of 12) is: Who To Apply With?. If you have any further visa related questions, call +27(0) 21 761 4608 now. Alternatively email info@moveup.co.za for general visa inquiries.